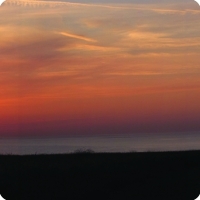 This site lies at the western extremity of the Thanet Coast SSSI but the SSSI makes no mention of its geological potential. The picture right gives a general view of the Long Rock area. A range of geological, geomorphological and archaeological environments is displayed. These include last interglacial (Ipswichian) and glacial (Devensian) vertebrate remains with fluvial gravels, a post glacial (Holocene) forest bed and archaeological material ranging from Acheulian and Levallois flakes to Medieval ceramics. Only the foreshore deposits of this important site remain; on-shore they have either been removed or obscured by building or coastal protection. The deposits occur in pockets and channels cut into the underlying London Clay allowing them to be viewed in plan. Normally such deposits are only seen in section. 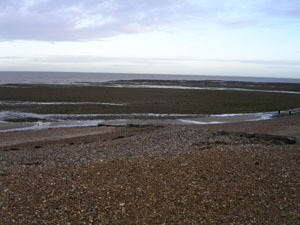 Long Rock forms an irregular gravel spread on the foreshore to the east of Tankerton and north of Swalecliffe. The cliffs and foreshore here have a long history of research, with publications back to 1834. The sedimentary sequence on the foreshore is complex and unevenly distributed but it has proved to be an extremely rich and diverse resource of fossil and archaeological material. Vertebrate material from the cold stage, and possibly the earlier warm stage, mollusca, fruit, branches, logs and boles from the 'forest' bed, Lower Palaeolithic and Mesolithic worked flints and ceramics from Early Bronze Age to medieval times are found on the foreshore. 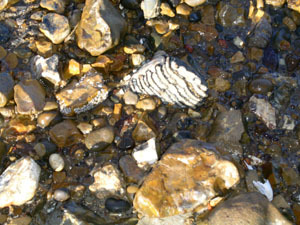 The picture above left shows an elephant tooth exposed by the receding tide. The complex and fragmentary nature of the foreshore sequence means that relationships of the components are far from fully understood. There is a need to ensure that no future coastal work further damages the site. The site itself is variously of coarse gravel and clay so stout footwear is required. The site is on a foreshore and the tide is a major safety factor. The tide comes in round the inshore part of the site ('Short Rock'), but there is a relatively safe exit to the east. The outer part of the site ('Long Rock') is cut off as the tide rises and should be visited only at spring low tides and with an experienced guide.